Job site construction trailers are used all over. Some are temporarily placed in location and then relocated, and some are permanently stationed. 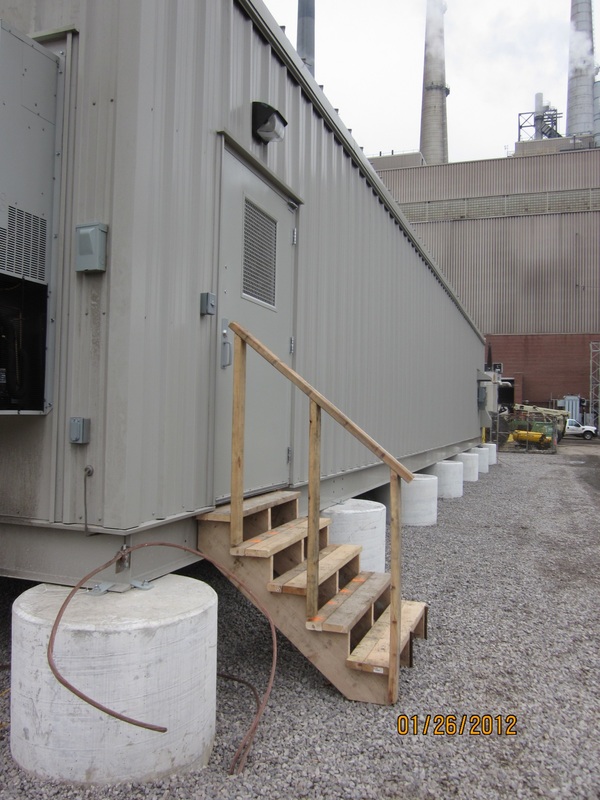 The construction trailers can house offices, tools, machinery, electrical controls and more. 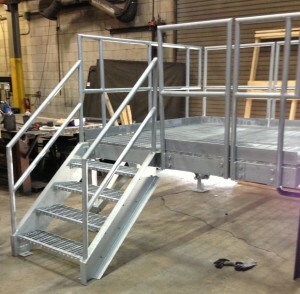 Oftentimes, job site trailers will have temporary wooden stairs affixed, like the above photo. But what do you do when the construction trailer is actually in a permanent or semi-permanent location? 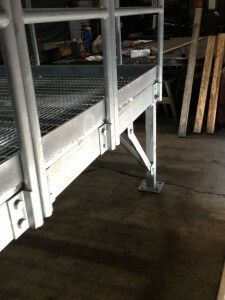 We often get calls to fabricate replacement construction trailer stairs to replace temporary wooden steps. 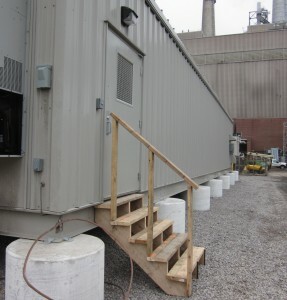 The stairs below were used with job site trailer that housed electrical control modules and needed a safe OSHA compliant means of access from two sides. 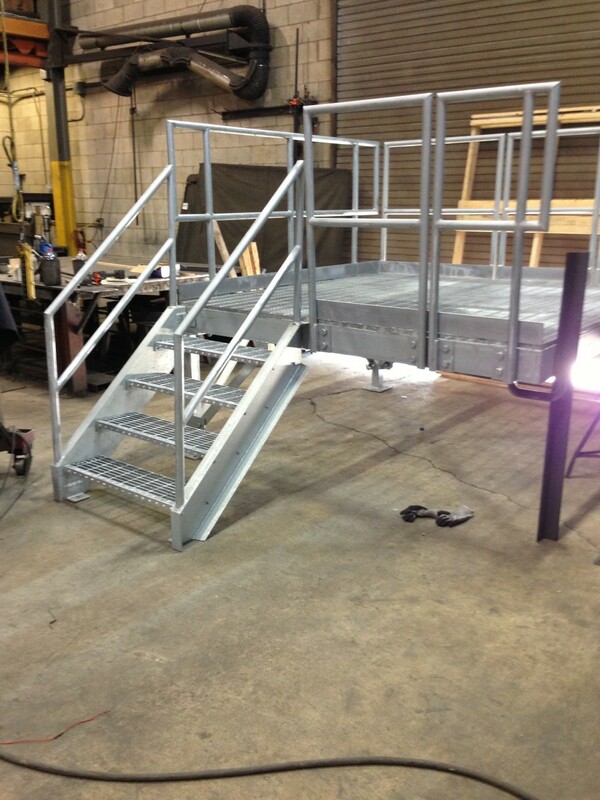 As the construction trailer had some large control modules inside, we supplied stair landings with handrails that can be unbolted, to allow ample access should any module need to be replaced. 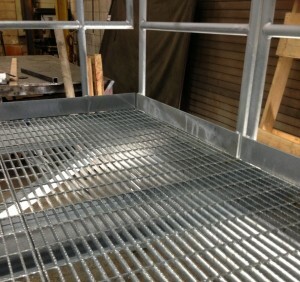 The stair railings were welded to the stair stringer to maintain a stiff, wobble-free grabbing surface. 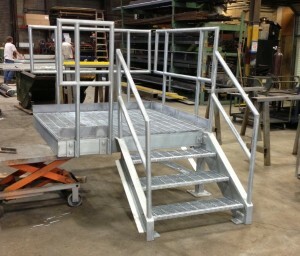 In an effort to help keep costs down on the project, the stairs were supplied with two support columns instead of four. This was achieved by bolting the platform edge of the landing to the existing structure, allowing for less steel to be used and a smaller concrete pad to be poured. Construction trailers are generally located outside in work zones, oftentimes lacking paved access to the doors. With that in mind, the stair treads and stair landing surfaces are most commonly constructed from bar grating. Bar grating is inherently self-cleaning; mud, dirt, rain and snow fall through the treads keeping them cleaner and safer to step on. The landing also has toe kick around the non-entry and exit locations. The 4” high toe guard stops tools and other items from being kicked off the landing. It also serves to stop a slipping foot from falling off the landing, potentially preventing a serious injury and employee downtime. 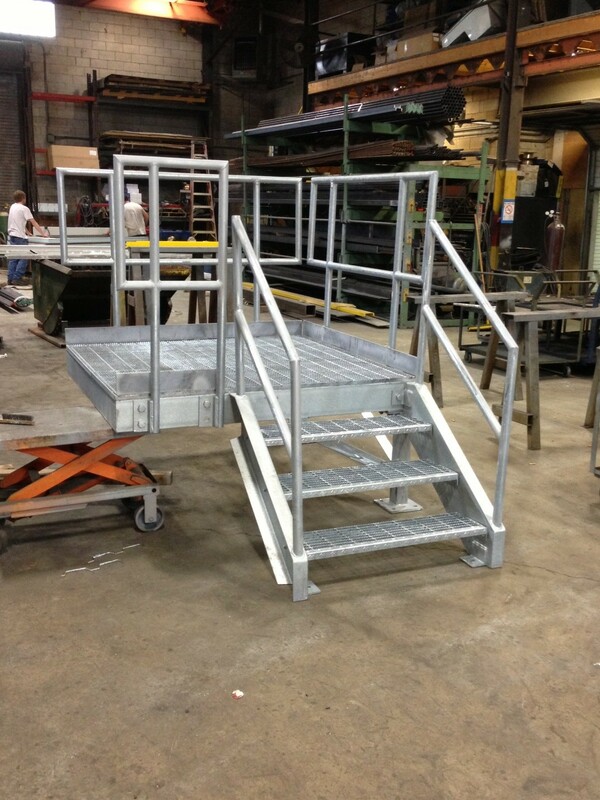 As for finish, hot dipped galvanized is one of the best, cost effective finishes to use when the stairs will be exposed to the elements. No chipping, peeling or blistering of the coating will happen. In fact, when the hot dipped galvanized surface is scraped to bare steel, it will ‘self-heal’. The zinc rich galvanized surfaces to the sides of the bare metal will sacrifice themselves to protect the base steel until all of the surrounding zinc is consumed. Hot dipped galvanizing also coats 100% of the structure because it is immersed in the zinc solution, as opposed to being painted on, which can miss hard to reach areas. 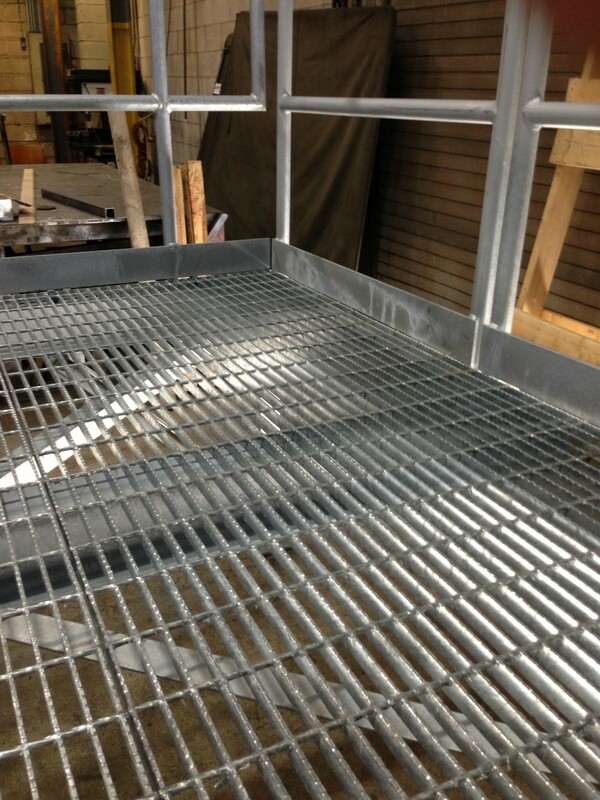 This entry was posted in mezzanines, stairs and tagged bar grating, construction stairs, galvanized, OSHA on January 28, 2015 by Brett.